For 15 years, the Woodstock Film Festival has brought independent film to the forefront. The festival celebrates the legacy of filmmakers who have consistently thrust themselves into the world of filmmaking seeking profundity and truth with little more than a camera and a dream. This legacy, though, is not one with any threads of similarity or routine, as Festival Director Meira Blaustein points out. When pressed for a running motif among this year's participating films, Blaustein struggles to answer. "Well, I suppose I could say conflict and resolution, Internet mythology, family issues, loss, struggles with identity, and...many more. It really is an extremely diverse group of films," says Blaustein. "It always is." Indeed, the films are as diverse as they are impressive. The festival's centerpiece film, Sisterhood of Night, will make its North American premiere. Directed by Caryn Waechter and filmed locally in Kingston, it tells the story of a group of girls who have broken away from the world of social media to enter a new, mysterious world deep in the woods. At the Regal Cinema in Kingston (a new venue for the festival), National Geographic explorer Jon Bowermaster's film Antarctica 3D: On the Edge will make its world premiere. Bowermaster's film focuses on the beauty of the seventh continent, and, more important, how it is changing. The festival also features world-class shorts that are not to be missed; this year will include Patrick Smith's Philip Seymour Hoffman on Happiness, a poignant animation in which the late actor shares his thoughts on happiness, life, and death. On October 15, Woodstock Playhouse will host the world premiere of East Jerusalem/West Jerusalem, directed by Erez Miller and Henrique Cymerman. The film documents the creation of David Broza's album (of the same title), produced by Steve Earle. The premiere is supplemented by a Q&A panel with Broza, Earle, Miller, and Cymerman, to be followed by a live performance from the album. As Blaustein explains, "This film and music explore the conflict in Jerusalem in a unique way—through hope, collaboration, and optimism." At this year's Maverick Awards Ceremony, Darren Aronofsky (Black Swan, The Wrestler) will be the recipient of the annual award, presented by Jennifer Connolly (Noah, Requiem for a Dream). Mark Duplass (The Skeleton Twins, The One I Love) will be the first recipient of the festival's Fiercely Independent Award. Duplass also co-wrote and -produced a film making its East Coast premiere—Creep tells the story of a young videographer who answers an ad on Craigslist for a job in a remote mountain town and discovers that there is more to his employer's request than he originally thought. The atmosphere of the festival is consistently described as intimate and casual. This year will see the highest percentage of featured artists in attendance—all but one film will be represented by its full cohort. There will be a large number of Q&A panels during which the public is invited to engage with the artists. Courtney Cox ("Friends," "Cougar Town") will be participating in a panel titled "Women in the Director's Chair," which explores the inspiring journey of female artists in independent film. Cox will be joined by Debra Granik (Winter's Bone) and Leah Meyerhoff. Cox's film Just Before I Go and Meyerhoff's I Believe in Unicorns will both be featured at the festival. Those interested are encouraged to purchase tickets in advance as films and panels tend to sell out; however, a number of stand-by tickets are reserved. Standers-by are encouraged and often admitted. So, how does one choose which films to see? Blaustein doesn't offer any recommendations. She explains that she does not play favorites, and that "all of the films are outstanding; they are all at the festival for a reason." Blaustein urges viewers to step outside of their comfort zone. Her advice? Think like the festival: "Be bold. Be diverse. Take chances. You won't regret it." The 15th annual Woodstock Film Festival runs from October 14 to October 19 at locations in Woodstock, Saugerties, Rhinebeck, Kingston, and Rosendale. 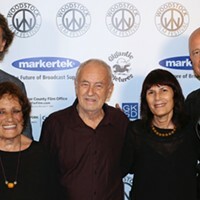 Woodstockfilmfestival.com.